These memoirs penned by the 86 year-old critic Edward (‘Ted’) Greenfield are thumbnail sketches of artists he has admired and, generally speaking, respected. His is a career lasting forty years during the second half of the last century, when he was music critic of the Guardian newspaper. Interwoven are chronological interludes tracing the outline of his life. The reader may be disappointed by the brevity of some of the essays and also by its hagiographic approach but that’s not entirely the case for there are also some trenchant observations and behind-the-scenes glimpses of some of them when the mask has slipped. The most interesting for this reviewer are the composers, particularly Walton and Britten, though Maxwell Davies is not far behind. Apparently Violet Carson (Ena Sharples of Coronation Street but then a staff pianist at the BBC’s Northern Region in Manchester) gave the premiere of a piano piece by Davies, the boy composer. Sharples was no mean pianist and also appears in Kathleen Ferrier’s diaries as her accompanist on one occasion. Whilst there is a degree of superficiality in the social whirl and annual trek to this British or that European Festival, which he clearly enjoyed, nevertheless Greenfield has a streak of humanity revealing a discerning understanding of musicians’ weaknesses, foibles, and above all, moods. This is particularly so in the case of instrumentalists he recalls, ranging from Larry Adler to Lydia Mordkovitch, each with their baggage of hang-ups and problems. He is candid: ‘I then took [Ian Bostridge] aside and gently suggested that he should try to look less miserable when singing’. 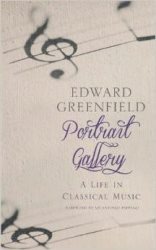 For those who attended his interviews — at FRMS conferences or at the Art Workers’ Guild of which he was Master — there is a reminder within these pages of how good at interviewing Greenfield was, particularly with singers such as Ian Partridge, Janet Baker and Joan Sutherland. He would tickle the vanity of Elizabeth Schwarzkopf or her rival Sena Jurinac, ‘who replied sharply, ‘I was never married to a record company’ meaning Schwarzkopf’s husband Walter Legge; he who starts the section entitled The Originals. This is a rag-bag of diverse (usually) men who ‘made a deep impression’ on his life. There is a sad but very interesting insight into one of Legge’s last visits to Salzburg. ‘He [Legge] would demand that I should ring him every morning and see whether he was free to meet up that day. As often as not, he would say he was expecting “Herbert to call” meaning Karajan. In the event Karajan never did, as he kicked aside those who had furthered his early career’. Greenfield takes a magnanimous view of Edward Heath in one of the longer pen portraits, both as a conductor (he gave ‘a red-blooded performance of Cockaigne’) and as a politician (‘I loathed Thatcher as much as he did’) and introduces Robert Runcie thus: ‘The first time I met Robert Runcie, Archbishop of Canterbury, he was doing the washing up’.